American inventor LaMarcus Adna Thompson (1848-1919) is known today as the “Father of the Gravity Ride.” Inspired by the Mauch Chunk Switchback Railway in Pennsylvania and the work of other inventors, he created the world’s first gravity powered roller coaster amusement ride, opening at Coney Island on June 2, 1884. Later he would patent a style of coaster known as L. A. Thompson’s Scenic Railway featuring a theme, elaborate backdrops and lighting effects triggered by approaching cars. Opening in 1910, Thompson’s ride at Venice Beach, California is generally considered his masterpiece with its fake mountain scenery and Egyptian temples. 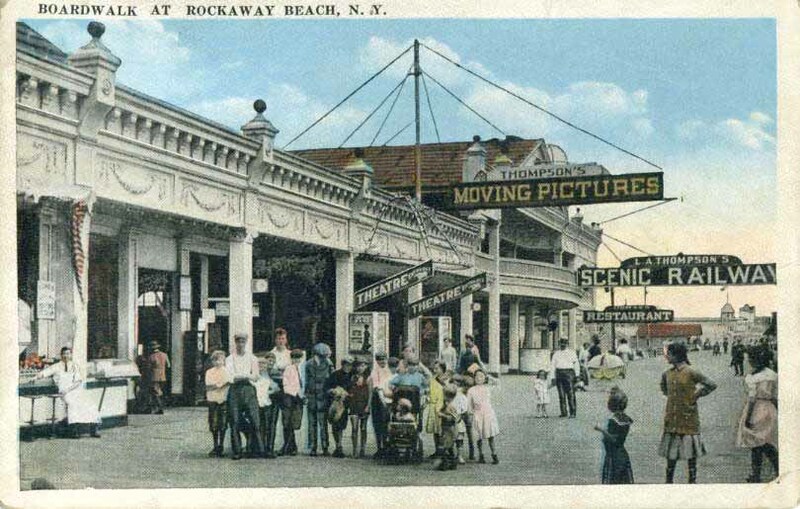 In 1913, Thompson made a brief foray into the motion picture industry by acquiring the American rights to a screen that could be used in an “ordinary theatre either by day or night.” An unsuccessful demonstration at Newark, New Jersey followed by an installation at Rockaway Beach, next to L.A. Thompson’s Scenic Railway. F. H. Richardson, columnist for the trade publication Moving Picture World invited to view the results. Richardson continued with a few more criticisms about the equipment and its operator. Always looking for improvements within the industry, Moving Picture World could be very critical of poor theatre construction and presentation. Finally back to the screen. Above postcard is part of the Theatre Talks LLC collection. Cezar Del Valle is the author of the Brooklyn Theatre Index, awarded “2010 Outstanding Book of the Year” by the Theatre Historical Society of America.